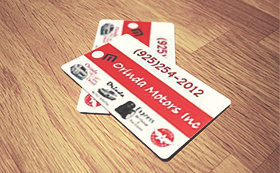 Rewards Card - Orinda Motors Inc.
Click to check your balance! Because you use us and trust us, we want to pay you back. 3% of each repair bill from Orinda Motors or Express Oil Change and Tire Center goes into a special fund to be used as a discount for future services. Discounts earned from the Rewards Card may be redeemed at Orinda Motors, Express Oil Change & Tire Center or Orinda Auto Detail. You can check your Rewards Card balance any time on our web site. IT PAYS TO SHOP AT ORINDA MOTORS! Current customers: Login to see your current balance!